Please review the calendar below for available dates and then fill out the form below. Required fields are denoted with an *. Our rapid response team will contact you shortly. THE LATEST A RESERVATION CAN BE MADE IS 10PM. Raven has a NO PARTY BUS policy on Friday and Saturday nights. Special arrangements may be available for other nights. Will you need Bottle Service? Raven does not charge a reservation fee or a bar minimum, nor do we require bottle service for table or space reservations on Thursday and Friday nights. (Exceptions may apply for certain parties). On Saturday nights the same rules apply, however, due to high demand, preference will be given to confirmed bottle service requests. In addition, the upstairs VIP seating area requires a bottle service purchase for Friday and Saturday nights. Confirmed Saturday reservations receive a 20 person all night guest list. Confirmed Friday reservations receive a 30 person all night guest list. During Club Raven on Friday and Saturday nights, our resident VIDEO DJ plays Hip Hop, R&B, and Pop Music Videos from the 90s to the new millennium. On Thursday nights starting at 9 PM we throw it back with two floors of music, two DJs & drink specials. 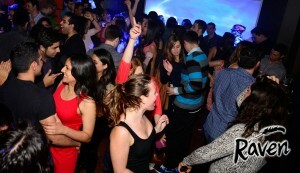 Raven has four large U-booths on the main level that surround a casual dance floor. Upstairs is the main dance club where there is single private seating area with two couches and several ottomans. The back bar, a bit more secluded, can accommodate larger groups. All of the reserved areas are semi-private as Raven is a loungey dance club that encourages the mingling of a diverse mix of friendly people. Many groups use the reserved seating area as their gathering spot, as guests wander upstairs to the dance club, outside to our smoking patio or visit one of our three bars for a tasty specialty cocktail. Please Note: Absolutely NO smoking or vaporizing is allowed inside the venue at any time. Raven does not serve food but partners with adjacent restaurants and catering companies to provide snacks and appetizers. We ask that all food service be completed by 9 PM on Friday and Saturday nights.